Tiger (Panthera tigris) is mammal that belongs to Chordate phylum (having spinal cord), Vertebrate sub phylum (vertebrates), Felidae family (cat), Panthera genus, and Tigris species. They are the biggest cat that lives on earth. Even they are bigger than a lion. Besides being the largest cat, they are also the second fastest cat in terms of running, after cheetah. In the class of carnivorous animal, they are the third largest carnivores after polar bears and grizzly bears. They have stripes on its body. The stripes are usually used as identity because each tiger has a different striped pattern. Besides used for an identity, it is also useful for camouflage from its prey. Commonly, colors of the stripes are orange and black while its hair chest is white. Nevertheless, white Siberian tiger have black stripes while its’ body is white. 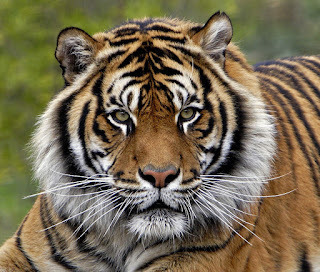 In general, tigers have a white mane on the bottom of face. Unlike lions, their mane is less. Just like other species of big cats, they have a white spot on the back of both ears. They are a meat-eating animals (carnivores). They usually hunt fairly large prey such as forest cattle, elk, deer, and pigs. They belong to solitary animals. They quietly stalk their prey until they are close enough to pounce. Then, they kill their victim with a bite to the neck or back of the head. They prefer to live and hunt alone. Although come from the same family, they are different from ordinary cat. They really like to swim. When hunting, the tiger will conceal itself in bushes or long grasses close to their intended preys rear or side. They will gradually, silently sneak forward; stalking the animal, which is unaware of the hunters proximity. They pounce on their victim, using their strong hind legs to support the struggle with the prey and their front legs to pull the victim to the ground. There were once nine subspecies of tigers: Bengal, Siberian, Indochinese, South Chinese, Sumatran, Malayan, Caspian, Java and Bali. Of these, the last three are extinct. Tigers are viviparous animal. They reproduce by whelping. They usually breed in November until April. They have a gestation period about 3-4 weeks and can produce 3 to 4 cubs. 2. How tigers react to water? 3. All tigers have a ..... spot on the back of both ears. 5. How do tigers stalk their prey?